Eris’s original nickname was Xena and I think that that is the name that should have remained. The symbolic energy surrounding Xena mythologically speaking (even though Xena is a modern invention) is much higher and more positive than the concept of a goddess of discord and strife. Xena was the dwarf planet’s nickname while Mike Brown decided on a mythological name. At the time I e-mailed him back in 03, I didn’t realize there was a rule that heavenly bodies had to be named after ancient God/Goddesses. I actually wrote to him begging him not to name the planet something stupid, and to pick a Goddess as there are so few represented. I had one in mind, but unfortunately the name was already taken. I agree that the Goddess of discord and strife is pretty negative, and I wish he hadn’t named this very large “dwarf planet,” after a Goddess that was supposed to love the sight of human blood being spilled. Let’s hope Eris was unfairly named, and perhaps is more about the general color of the mass consciousness, perhaps the deep dark id-like side of humanity, or the life blood of a century rather than just her horrible reputation as being a viscious death mongering blood letting, cold, malacontent, Goddess of chaos. I wonder if perhaps her story, and her attributes changed over time as the Greeks became more patriarchal. This is a common theme, demonizing Goddesses as a culture turns from the feminine aspects of God for political reasons to support the new patriarchal system, and thereby changes the attributes of a Goddess. This was also done in the bible where several demons were actually, at one time, Goddesses and Gods that the ancient Jews worshipped before becoming monotheistic. It’s a common political-religious tool to frighten people into a new belief system that enforces a new political structure. Thank you Denise for your advice on Minara Resources, MRE, The company was born in Perth, Western Australia not Sydney, Australia despite this, the reading was accurate in that they were doing very well in 2006. Would this have much affect on the overall accuracy of the astrological reading? When I read and re -read some of your answers to our questions there is a thread throughout that somehow gives me faith and peace (something I haven’t had recently) that the worlds economy wont end but transform, even though our foundations, our basic security is under threat, and there will be massive changes and challenges to come, there is a larger picture that is ultimately for the good. At the end of the day materialism isn’t what it is made out to be and can often create so much misery as seen in our Western worlds. My gratitude to you for helping me see this. The timing would be slightly off with a city change, but the basic chart would be the same. Also if this stock is traded in Sydney then it would likely take on the timing of Sydney. I’m very glad i could help you feel better during this period. These are growing pains and if we all stay involved and demand our world become a better place, it will be. I wouldn’t feel comfortable giving a good time specifically without the birth times of both people. In general both people are Leo’s and there are a bunch of conjunctions. I can’t tell however if their moons or rising signs are square or in the later case, trine or whatever. The woman born in the Philipines hasn’t gone through her Saturn return yet, meaning she hasn’t completely come into her own. That will happen in September of 2009. If it were me, in this case because there is a big age, and cultural difference, I would wait until that return happens and get married October of 2009 when there are a lot of positive aspects between the outer planets and stuff going on in both charts. If one can’t wait then it’s best to do it while the sun is in Sagittarius, either the weekend of December 5 or on the 10, or 11th. But mostly I’d just go with your own gut feeling, and do it when convenient. Stuff like marriages and births have a tendency to work out the way they are meant to. So I wouldn’t sweat it too much! That’s a big yes from the tarot. Oddly a woman is at the center of this answer. I feel his wife maybe a secret weapon. It looks as though he works very hard. Also the Justice card comes up which makes me believe he’s got a diplomatic personality, and works well with other people, often moderating between different people’s opinions, and coming up with a workable solution. It also looks like as he gets into the job he’ll soon uncover a lot of deceptive practices, and out right lying that took place on wall street. This could potentially lead to a criminal investigation which could also be why the Justice card comes up. There is another woman involved in the pursuit of justice along with him. This probably won’t happen right away, at the earliest it would be three months into the Obama administration when this angle is considered. Perhaps it will be Nancy Pelosi or another powerful woman (Hillary?) who insists on prosecuting those responsible for what will turn out to be a major swindle of the American public and the world economy. We are only seeing the tip of the iceberg here. There are people involved in this who definitely deserve to do prison time. Whether they do, that’s another question altogether. I’m wondering if this stock performed well in the spring and summer of 2006. Because if it did then this chart is accurate. It would have been off and on during that period and sort of out of the blue. In general though the company should have had other troubles going on that I won’t bother going into, but it should have had a little unexpected boon during that time period. If it did not, then take this info with a grain of salt because I may not have the right chart and timing in the market is everything, and without the right chart, the timing will be wrong. 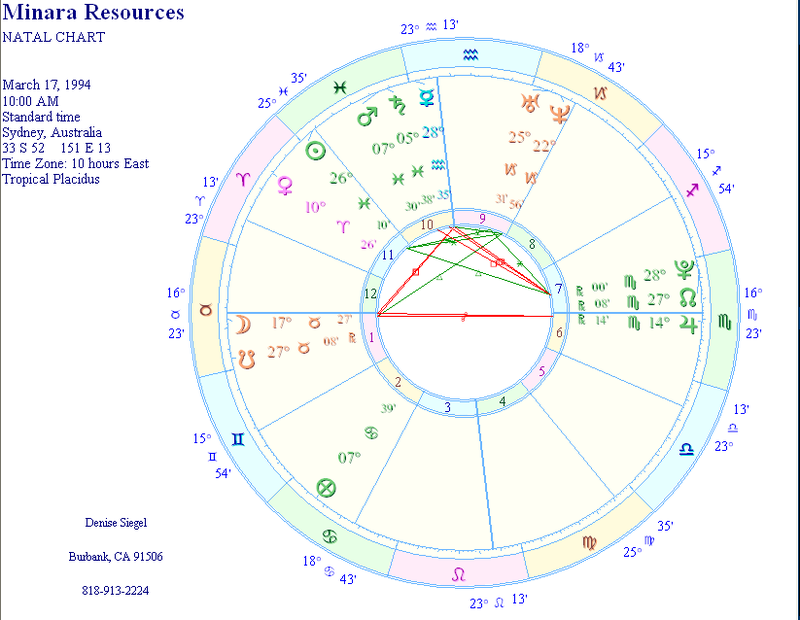 According to this chart transiting Pluto is (and has been for awhile) going through the company’s 8th house (shareholders) not a good thing for the shareholders in general. However, there are some good aspects coming up starting at the end of December of 2010 and into 2011, when transiting Pluto will sextile the company’s Saturn in the 10th. This will bring them opportunity to do (or do more) business abroad, and news of this will make the stock value go up. And again when Pluto sextiles the company’s Mars in the 10th in February of 2011 on until about 2012, when the opportunity for the company to fulfill some its expectations, and become more aggressive, perhaps even expand operations, that will give this company more value. There will also be an opposition at that time to the company’s part of fortune which can either mean jackpot or crisis. So you’ll have to watch them carefully as all these aspects are sextiles and sextiles are merely opportunities, not absolutes. Also during this time Neptune will be conjuncting the company’s Mercury either making them come up with visionary solutions or it could cause lying, confusion and secrecy. Really, if you can wait until 2016 to sell, I’d do that because there will be very powerful trine from transiting Pluto to the company’s Moon, and also it will set off Jupiter. I would not however freak out right now and feel you have to sell this stock. There isn’t anything going on in its chart to make me think it’s going to fold anytime soon. So if you can wait out this storm, then it will get better. Remember though, I’m an astrologer and a psychic not a financial investment person, so it’s also a good idea to seek advice from someone who knows the logical side of this as well. I couldn’t find their times of birth so I ran solar charts on them. 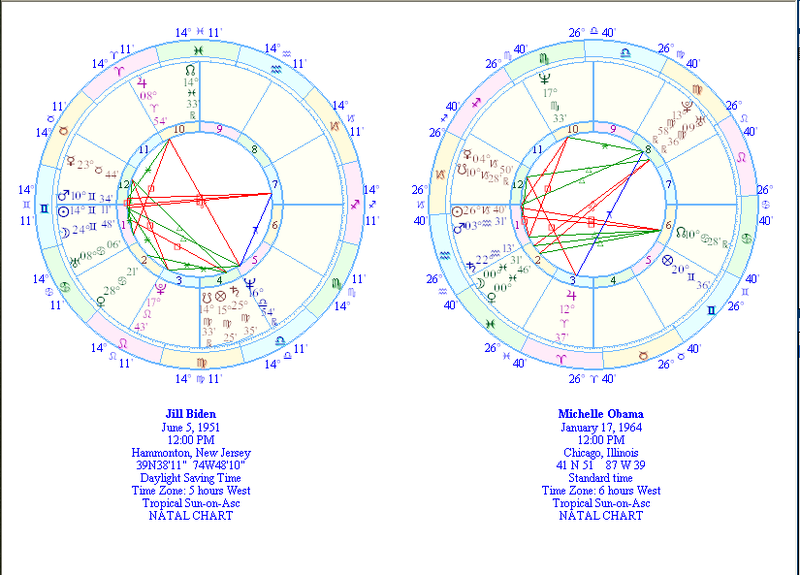 Here are both women’s solar charts. Both women are forthright, strong with Mars near their Suns, they are also aggressive, physical, athletic and don’t back down. Michelle is emotionally very soft and compassionate which foils her very aggressive, ambitious outer personality. Her luck has always been because she made it herself with Jupiter in Aries. She’s a humanitarian with Saturn (the ruler of her Sun) in Aquriaus, plus that Mars in Aquariaus conjunct her Sun. She’s extremely brilliant with Uranus/Pluto trining her natal Mercury. I do worry about Michelle Obama’s safety more than anyone else. And looking at her chart in February of 2010 Pluto will be going over her natal Mercury. If she has Gemini or Virgo rising this could be a very bad thing as Mercury would rule her chart or if she has Mercury in her 8th house. I warned before about her safety and to me this confirms my fear that she maybe more of a target then even her husband. Perhaps because she will be seen as easier to get to. I’m worried about her. Jill is also intelligent and has a strong sense of family and probably values her privacy a lot, and is a bit of a homebody. As I said she’s also strong and aggressive, but not overly so as Mars, and her Sun conjunction are softened by a trine to Neptune. So she makes her point, fights it out, but not unfairly and also listens to the other person. Despite all the airy Gemini in her chart she’s pretty practical with Mercury in Taurus, and likes the finer things in life, and is willing to work hard for them — Mercury trine Saturn in Virgo. She too like Michelle has made her own luck in this world, and probably came from modest beginnings. I’d say for various reasons that I won’t get into, she’s also very sensual in a good way. She’s affectionate to those she loves, and isn’t afraid to express her feelings with her family. Hopefully there times of birth will become public at some point, and I can give a better analysis.